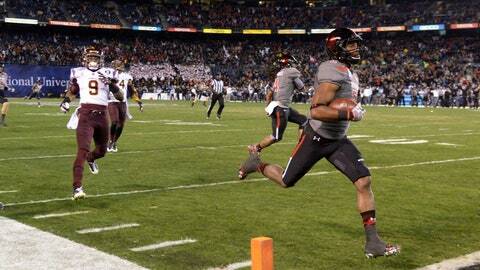 Texas Tech receiver Reginald Davis goes into the end zone for a touchdown on a 90-yard kickoff return during the third quarter of the Holiday Bowl against Arizona State. SAN DIEGO (AP) — Freshman quarterback Davis Webb threw for 403 yards and tied the Holiday Bowl record with four touchdown passes as Texas Tech raced to a 37-23 victory over No. 16 Arizona State on Monday night, snapping a five-game losing streak. The Red Raiders (8-5) won for the first time since beating West Virginia on Oct. 19. The Sun Devils (10-4) lost their second straight. Sun Devils fall flat in ’embarrassing’ bowl defeat, ending otherwise-strong season on sour note. Said Ward: "We didn’t get any respect all weekend long. It was all about Arizona State and their record and this, that and the other. So we used that to fuel the fire." Ward added that the losing streak "preyed upon us pretty heavily. No one likes losing that much and lose that much on the road. It starts depressing the team a little bit. We just did all we could to prepare for this game. During the bowl practices, the time we had together helped us bond together." "I’m very embarrassed for our program," coach Todd Graham said. "As coaches, we didn’t have our guys prepared to play. They came to play. We didn’t. Give them credit. I was embarrassed for the fans that showed up today. We didn’t have our players prepared. Zero excuses, but we didn’t have our players prepared to play. It was an ugly game offensively and defensively. We just didn’t play very well. They were the more passionate team today."